Location: Barra - Salvador ? BA. Enjoy the best sea front Apart Hotel in Praia do Farol da Barra, equipped with air conditioning, TV, phone, and broadband Internet. The hotel has a panoramic terrace with swimming pool and restaurant. The room is comfortably suited for up to 4 guests. For price information, please consult us. Discount prices for stays longer than 10 days. Breakfast not included on price. We traveled to Salvador for a family vacation and fell in love with the area and the people! The apartment is located in a great area with the beach, shops many restaurants nearby! My Portuguese is not very good, but the staff was also very helpful! I will definitely stay here when I come back to Salvador. Thank you for a great experience! Your satisfaction of words encourages us to continue efforts to doing the best for our guests. This place is not as nice as the pictures lead you to believe... it is on the beach which is a plus but the surrounding neighborhood is not the best. Moreover, it is extremely small and would never recommend it for more than 2 people. The pull out chairs are ridiculously uncomfortable. Most importantly, it is completely infested with cockroaches - we found hundreds all over the place. We left immediately and tried contacting Edvaldo who was nowhere to be found. He did not return our phone calls or emails and basically took our deposit money for a place that was completely unsuitable. We ended up moving to Rio Vermelho to the Ibis hotel which I would highly recommend. DO NOT BE FOOLED INTO STAYING IN THIS APARTMENT!! Férias perfeita passei ao lado da minha filha. Part hotel é simplesmente sensacional,funcionários super prestativos e simpáticos desde da recepção até as meninas da limpeza. Perto de tudo o que você precisar,farmácia, shopping,bancos,restaurantes,lojas e mercados. Lugar maravilhoso recomendo a todos de olhos fechados. Obrigado Danielle, por ssua avaliação positiva. Ficamos felizes quando os nossos hóspedes, também, tiveram dias felizes em nosso imóvel e em nossa cidade. Seu depoimento nos estimulam a continuar invetindo com vistas a proporcionar mais conforto e bons serviços a quem nos ,procura. Espero que retorne poRque será um prazer muito grande hospedá-la. Ótimo Flat, localização perfeita, perto de tudo e fácil acesso a outros locais. No carnaval então...um verdadeiro camarote. O proprietário sempre gentil em atender os nossos questionamentos e os funcionários muito atenciosos. sgradecer pela escolha do meu imóvel e fico na espera do seu retorno. Me surpreendeu a apart, está tudo certo conforme o previsto, foi uma experiência maravilhosa, e certamente quando voltar a Salvador já sei onde ficar hospedada! Fiquei extremamente feliz ao ler sua opinião sobre o nosso imóvel! É um grande estímulo para que nós continuemos aplicando melhorias visando oferecer mais conforto aos nossos hóspedes. Foi um grande prazer hospedá-la e espero o seu retorno. Apartamento limpo e bem organizado, vista maravilhosa para a praia do farol da barra. Fomos bem atendidos e voltaremos em breve. Situated in Praia do Farol da Barra. 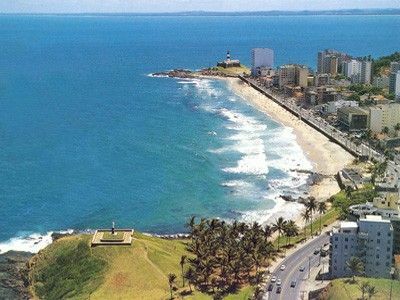 Stay in a privileged location, with a full view of Avenida Oceânica (Carnival circuit) from the Farol [Salvador?s Lighthouse] to Morro do Cristo. You?ll be staying in a tourist quarter, provided with: malls, banks, supermarkets, drugstores, etc., and Jardim Brasil point, where you can find excellent restaurants, dance clubs, and bars. All facilities can quickly be reached by foot.